The 11th International Exhibition on Electrical Technology & Equipment - Vietnam ETE 2018 and the 8th International Exhibition on Products, Technologies of Energy Saving & Green Power - Enertec Expo 2018 are scheduled to take place from July 18 to 21, 2018 at Saigon Exhibition & Convention Centre (SECC), Ho Chi Minh City. 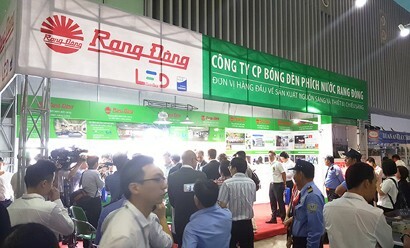 Vietnam ETE 2018 and Enertec Expo 2018 are expected bring together nearly 200 exhibitors with roughly 300 booths, including leading brands and enterprises in the country such as Ho Chi Minh City Power Corporation (EVN HCMC), Vietnam Electrical Equipment Joint Stock Company (Gelex), ABB and Panasonic. The green energy category will feature big names like Dien Quang Lamp, Rang Dong, Redsun, VES and GEE. The events will also draw exhibitors from Germany, France, the United States, Sweden, Japan, Korea, China, Taiwan, Hong Kong and Thailand. The programme was sponsored by EVN HCMC and co-sponsored by Dien Quang and Rang Dong. The exhibitions will be incorporated with international thematic seminars hosted by the Department of Industry and Trade of HCM City, authorities, project owners and experts. The two exhibitions will be open to the public from 10:00 a.m. to 5:30 p.m. on July 18, and from 09:00 a.m. to 5:30 p.m. from July 19 to 21, 2018. These events are sponsored by the Ministry of Industry and Trade of Vietnam, the HCM City People’s Committee and hosted by the HCM City Department of Industry and Trade together with the HCM City Centre of Supporting Industries Development and C.I.S Vietnam Advertising & Exhibition Joint Stock Company.